Phil's Indian Scout in Baltimore before leaving for the trip. 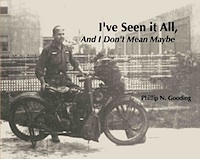 Indianapolis Speedway - Phil arrived here the day after the race and ran his Indian around the track. I started from Baltimore, Maryland on a trip to tour the United States at 6:30 a.m. I had clear weather and dry roads. All the roads were asphalt, cement, and brick in good condition. The mountains between Frederick, Maryland and Wheeling, West Virginia were very steep and long making it impossible to pull some in high with my Indian Motorcycle. I arrived in Bridgeport, West Virginia at 5 p.m. having covered about 270 miles. I am going to spend the night in a hotel here. I left Bridgeport West Virginia bound west at 7:30 a.m. after having to change all my haversacks from the rear of my mo- tor to the handle bars because it was too much vibration on the rear. After passing through Cambridge, Ohio all the country was level making it possible to see sometimes ten miles of straight, level good road. All the roads so far have been brick, cement or asphalt. I arrived here in Indianapolis, Indiana at 5:30 p.m. standard time and found out that the time had changed at Dayton, Ohio to Central Time, making my time of arrival 4:30 p.m., one hour difference. I covered 304 miles today and am staying at the Indianapolis YMCA. It rained in Indianapolis all morning until about 11:30 a.m. I left the city about noon but only succeeded in getting to Terre Haute, Indiana before the rain started again. I was about two miles from the town, so I spent the night in a barn, getting my supper and breakfast from the farmer after talking about the East with him. I hit the hay about 6:00 p.m. and slept very well. I covered about 70 miles in the day over good roads. I woke this morning at day break (3:30 a.m.) and started on the road, getting to St Louis, Missouri at 10:00 a.m. The Mississippi River runs right by city. I spent most all afternoon riding on the double-deck buses and streetcars. I worked out in the gym of the Y about 2 1/2 hours getting down to my wrestling weight of 159 pounds. The match came off at 8:30 p.m. sharp in the Y building at Grand Ave. and Sullivan St. I was matched with a local Y man who had much more ex- perience that I. We wrestled for 18 minutes and they decided it a draw. There were six other bouts and then the judges asked that the draw be wrestled off. We went on the mat again for 18 minutes and the judges gave the decision to my opponent, Mr. George R. Littleton, of St. Louis, Missouri. In the days ride I covered 177 miles, all was good but 1 mile of mud. I left St. Louis, Missouri at 6 a.m. and had fine roads for about 25 miles. From the end of the paved road to Calwood, Missouri the road was nothing but mud. I had a hard time getting through and took quite a few spills but did not hurt me much. I covered 110 miles in 12 hours. I am staying at a hotel here in town. I left Calwood early in the morning in a sea of mud. I only covered 25 miles and burnt my clutch on [the] motorcycle out. 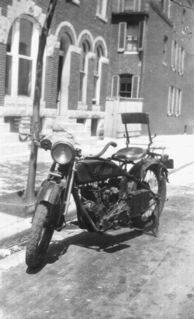 Had to be towed by a mule for 7 miles to Columbia, Missouri to a motorcycle garage where I telegraphed to St. Louis for parts. The roads in most places had just been graded and they said it had rained every day for 3 weeks. I am staying at the Y.M.C.A here. From Columbia to Marshall is all dirt roads like the others, but I covered 70 miles after getting my motorcycle repaired. I camped out in Marshall in a camping grounds. Had no trouble with the motorcycle after getting on the road.